Lewis Hamilton wins pole position for Formula 1 Belgian Grand Prix at Spa-Francorchamps. 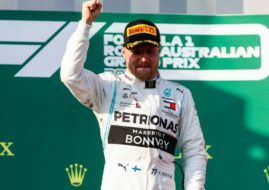 Mercedes driver won his sixth pole position in a row, becoming first to do so since Michael Schumacher in 2000/2001. 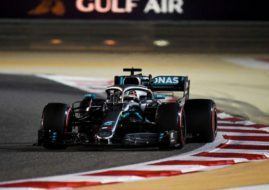 Mercedes, as it was expected, set the pace during first round of qualifying, but in the finish, gaps between drivers tightened. Anyway, Lewis Hamilton was the fastest with 1:48.908, just 0.015s ahead of his teammate, while Sergio Perez was surprisingly third. It was an another frustrating day for McLaren as both Fernando Alonso and Jenson Button failed to qualify for the second round. Out of Q2 also remained Manor’s pair Will Stevens and Roberto Merhi, and Sauber’s Felipe Nasr. Kimi Raikkonen was unlucky during second round as his Ferrari stopped on the track after a technical failure, so he will start from 15th place on Sunday. Session was red flagged for a few minutes, so only eight minutes remained for the drivers to find a way into third round. Max Verstappen has decided to stay in the garage for the rest of session and save tyres, due to his grid-place penalty, while the other three who failed to qualify for third round were Marcus Ericsson, Daniil Kvyat and Nico Hulkenberg. Nico Rosberg was the fastest again (1:47.955) what was 0.069 faster than Hamilton’s best, while Sebastian Vettel was third, just ahead of Sergio Perez and Felipe Massa. When it became important, Lewis Hamilton proved why he is reigning champion and championship leader. He clinched another pole position with a lap time of 1:47.197, beating Rosberg by 0.458s. Valtteri Bottas will start from third, accompanied by Romain Grosjean in second starting row. Sergio Perez and Daniel Ricciardo will start from the third row, places in fourth row in the grid are won by Felipe Massa and Pastor Maldonado, while Sebastian Vettel will start from ninth what is far from Ferrari’s expectations. Carlos Sainz starts from tenth position.